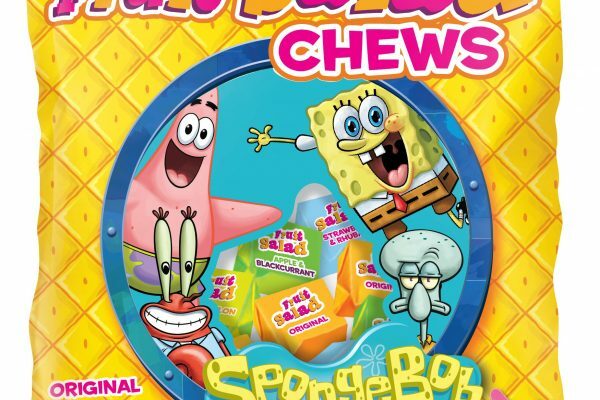 Tangerine Confectionery, the manufacturer of British retro favourites Wham and Fruit Salad, has struck a license agreement with Nickelodeon & Viacom Consumer Products to create limited edition SpongeBob SquarePants and Teenage Mutant Ninja Turtles chews. Tangerine Confectionery has unveiled the new Wham and Fruit Salad sharing bag ranges inspired by the popular Nickelodeon characters. Wham Mini Chews receives a ‘Teenage Mutant Ninja Turtles’ makeover to become ‘Teenage Mutant Ninja Turtles Power Chews’, available in a sharing bag format (180g, MRRSP £1.49). The range includes all four main characters from the hit Nickelodeon series. Leonardo comes in Sour Blue Raspberry flavour, Raphael in Strawberry, and Donatello and Michelangelo morph into Wham Original and Brew flavours respectively. Receiving the Bikini Bottom treatment is the manufacturer’s retro favourite Fruit Salad range. The SpongeBob SquarePants Sharing Bag (180g, MRRSP £1.49) features SpongeBob as the Original flavour, Squidworth comes in Kiwi & Melon, Mr Krabs in Strawberry & Rhubarb, and Patrick in Apple & Blackcurrant. Gillian adds: “The SpongeBob SquarePants range boasts extensions to our popular Fruit Salad flavour with new recipes that we feel match the SponegBob characters’ unique personalities whilst extending the reach of our well-loved brand.